Corlew lists the value of the L J Perry at $1,500, a total loss with no insurance on the vessel. Much of the cargo was salvaged, and the $800 worth that was lost was insured. LA PALOMA (2000) The 28 foot sloop La Paloma flooded and sank April 30, 2000 approximately 50 miles southwest of Yakutat in the Gulf of Alaska. The only person on board was rescued by the U S Coast Guard cutter Anacapa. LACONNER (1965) The 35 foot wooden oil screw fishing vessel LaConner burned in Sverres Lagoon near Port Williams January 19, 1965. LADDY (1970) The boat Laddy was lost January 1, 1970 in Esther Passage. LADY ANN (1992) The 56 foot longline fishing vessel Lady Ann flooded and sank February 22, 1992 at Cape Cleare. All six crewmembers were rescued. LADY BEA (1994) The 32 foot salmon seiner Lady Bea caught fire and was lost July 24, 1994 at Naknek. One crewmember was also lost. LADY BLACKIE (2007) The 90 foot fishing vessel Lady Blackie flooded and sank November 26, 2007 near Wide Bay on the Alaska Peninsula in the Shelikof Strait. The Lady Blackie was towing, attempting to repair and dewater the 197 foot fish tender barge Fort Yukon when her generators and main engine shut down. Water was discovered in the Lady Blackie’s fuel filters. The effort to assist the Fort Yukon was initially in Wide Bay but the loss of power on the Lady Blackie along with high winds and seas forced the two vessels through the outside islands into the Shelikof Strait. The Lady Blackie caught up on shoals, was holed and began taking on water as the Fort Yukon broke free and drifted into the Shelikof Strait. The crew of the Lady Blackie abandoned ship to a life raft. All four crewmembers and a dog were rescued by a U S Coast Guard Helicopter three hours after abandoning ship. The crew of the Lady Blackie took the EPIRB from the vessel when they abandoned ship, which alerted the Coast Guard, who then responded to their distressed condition. The Fort Yukon drifted up on Titcliff Island a day later and was lost. LADY BLUE (1987) The 90 foot fishing vessel Lady Blue sank January 4, 1987 at Unimak Pass. LADY C (1984) The crab fishing vessel Lady C sank August 21, 1984 at Kennedy Entrance near Perl Island. LADY FAME (1979) The oil screw Lady Fame was destroyed by a storm June 26, 1979 off of the coast near Cordova. LADY JOANN (1995) The 34 foot wooden fishing vessel Lady Joann flooded and sank due to a hull failure August 22, 1995 in Cold Bay. All three persons on board made it to safety. LADY L (2001) The 80 foot crab fishing vessel Lady L flooded and sank from the stern January 20, 2001 eight miles south of Gore Point near the Barren Islands. She was traveling from Kodiak to her home port of Cordova following a Tanner crab season with a load of crab gear on deck. There were 25 foot seas and a 40 foot swell at the time of the disaster. All four crewmen were rescued by a U S Coast Guard Helicopter. A leaking hatch was the probable cause of the disaster. It was reported that the aft tank and lazarette hatches were not accessible because of the crab gear on deck. LADY LAUNI (1996) The 48 foot fishing vessel Lady Launi flooded and sank while under tow July 18, 1996 approximately 100 nautical miles southwest of Kodiak. There was no one on board at the time of the disaster. LADY LEE (1980) The 52 foot fishing vessel Lady Lee foundered January 30, 1980 in Kukak Bay on the west side of the Shelikof Strait. The crew was rescued by the fishing vessel Sharon W.
LADY OF GOOD VOYAGE (1993) The 86 foot steel cod fishing trawler Lady Of Good Voyage disappeared with all hands March 8, 1993. She had departed Dutch Harbor March 7, 1993 between 14:00 and 15:00 hours to fish for Pollock. On March 8, 1993 skipper Greg Schwindt had normal radio conversations at 09:30 and between 10:30 and 12:00. During the latter conversation Schwindt reported he was loaded and returning to Dutch Harbor that evening. The weather included wind from the SSW at 10 to 15 knots, air temperature 35 Fahrenheit and seas out of the south at three to six feet. At 16:27 March 8, 1993 the EPIRB signal from the Lady of Good Voyage was picked up by SARSAT. An urgent marine broadcast was issued on behalf of Lady of Good Voyage for vessels in the area of Cape Sarichef and Unimak Pass. Fishing vessels Windjammer, Sea Dawn, Forum Star, Nordic Star, Half Moon Bay, Chelsea K, Morning Star, Pacific Knight, Hazel Loraine I, Amber Dawn, Lola, Westward and Arctic IV responded along with the U S Coast Guard cutter Sherman. An EPIRB (found by the Windjammer), oil slick, crushed life ring (found by the Sherman) and empty life raft (found by the Sea Dawn) were all that was found northwest of Unimak Island. Lost were skipper Gregory R Schwindt (32) of Bellingham WA, Jeremy (Jay) Scott Hunter (37) of Bellingham WA, Larry J Hoover (29) of Newport OR and Eddie Hoover of Portland OR. LAIDA (1942) The 58 ton 64 foot wooden oil screw Laida was sunk by enemy action May 6, 1942, 30 miles NE of Port Moller. LARCH (1963) The 28 ton 47 foot steel oil screw fishing vessel Larch foundered October 11, 1963 off of Martin Island in the Gulf of Alaska. LARISA (1983) The crab fishing vessel Larisa caught fire and sank May 6, 1983 north of Unimak Island in the Bering Sea. LARK (1950) The 17 ton 36 foot wooden gas screw fishing vessel Lark was consumed by fire October 15, 1950, 12 miles off of Yakataga Beach in the Gulf of Alaska. LARRY (1969) The tug Larry was destroyed by a storm and sank October 31, 1969 near Cape Menshikof. All four crewmembers were rescued by bush pilot Orin Seybert and taken to Port Heiden. LARSEN BAY NO 2 (1970) The barge Larsen Bay No 2 foundered and was lost August 14, 1970 at Perryville. LARSEN BAY NO 3 (1961) The 61 ton 70 foot wooden scow Larsen Bay No 3 stranded and was lost April 19, 1961 at Swikshak Beach near Kodiak. LARSEN BAY NO 7 (1955) The 49 ton 60 foot wooden scow Larsen Bay No 7 stranded and was lost June 26, 1955 at East Anchor Cove near False Pass. LAUGHING LADY (1952) The 10 ton 33 foot wooden gas screw fishing vessel Laughing Lady burned May 10, 1952 at Latouche. LAURA (1986) The trawler Laura was presumed to have capsized and sank December 19, 1986 near Wide Bay in the Shelikof Strait. Two crewmembers were rescued by a U S Coast Guard Helicopter. High winds and seas cresting at 50 feet were the cause of the disaster. LAURA (1987) The 48 foot fishing vessel Laura sank January 28, 1987 in the Shelikof Strait. LAURA MAY (1901) The 234 ton 122 foot three masted wooden schooner Laura May stranded in the Kvichak River in Bristol Bay at 12 midnight Monday August 12, 1901. The vessel was being towed by the steamer Fram and had a cargo of 800 barrels or 90 tons of salted salmon worth $4,800. The Laura May had departed San Francisco April 18, 1901 bound for Bristol Bay with a crew of 23. Peter Johnson of Alameda is listed as master. The crew escaped to safety and the cargo was salvaged. The Laura May, valued at $6,000 became a total loss with no insurance. LAUREL ANN (1951) The 9 ton 30 foot wooden gas screw fishing vessel Laurel Ann burned October 18, 1951 at Ice House. LAUREN ROSE (1999) The 33 foot aluminum gillnet fishing vessel Lauren Rose was consumed by fire and lost May 28, 1999 on the Copper River Flats. The only person aboard made it to safety. LAURIE (1965) The 12 ton 29 foot wooden gas screw fishing vessel Laurie was consumed by fire August 15, 1965 at Naknek. LAURIE ANN (1964) The gas screw Laurie Ann burned August 10, 1964 at Cordova. LAVELTA LYNN (1984) The fishing vessel Lavelta Lynn sank August 20, 1984 four miles off of Black Bay southwest of Seward. LAWRENCE P (1954) The 22 ton 42 foot wooden gas screw fishing vessel Lawrence P foundered August 27, 1954, 65 miles west of Yakutat. LCT-71 (1943) The Navy landing craft LCT-71 foundered and sank in heavy weather September 9, 1943 in the Gulf of Alaska south of Kodiak. LCT-366 (1943) The Navy landing craft LCT-366 foundered and sank in heavy weather September 9, 1943 in the Gulf of Alaska south of Kodiak. LEADER (1955) The 50 ton 65 foot wooden gas screw fishing vessel Leader foundered July 21, 1955 in the Bering Sea. LEADING LADY (1964) The 57 ton 57 foot wooden oil screw fishing vessel Leading Lady was reported lost in the Good Friday earthquake of March 27, 1964 at Kodiak. LEADING LADY (1972) The 57 ton 57 foot wooden oil screw crab fishing vessel Leading Lady struck an unknown object and sank June 26, 1972 off of the northeast shore of Montague Island. The three crewmembers made it to shore in a life raft. The Leading Lady sank quickly taking 20,000 pounds of tanner crab with her. LEANNE (1962) The 12 ton 29 foot wooden oil screw fishing vessel Leanne was consumed by fire August 1, 1962 at Sand Point. LEGEND (1989) The 42 foot fiberglass fishing vessel Legend was found capsized April 30, 1989 in Lower Cook Inlet. There were no survivors. Lost were Richard Wiard, Doug Cundiff, Dave Garner and Mike Barney, all from Homer. LENA (1912) Two crewmen were lost December 7, 1912 when the launch Lena was lost between Galena and Jack Bays off of Grassy Island. The captain was rescued. LENA (1958) The 22 ton 44 foot wooden scow Lena foundered December 15, 1958 off of Yakutat. LESCHI (1979) The fish processing vessel Leschi came to rest in shallow water December 30, 1979 in Shotgun Cove near Whittier, Prince William Sound. The vessel was a retired side wheel steamer that had been used as a ferry in Washington State. The Leschi is now popular dive site. LETTIE (1902) The schooner Lettie was lost at Port Moller April 21, 1902. The vessel was travelling south from Nome on her way to Valdez. She was carrying 19 passengers as well as her crew. The schooner had encountered heavy weather and taken refuge in Port Moller. Her anchor chains parted and she was driven high up on the beach. All on board made it to safety. Comment: This is probably one of the two fishing schooners named Lettie out of Kodiak, and was likely salvaged. LEW-AL (1959) The 17 ton 36 foot wooden oil screw fishing vessel Lew-Al stranded and was lost December 16, 1959 in lower Cook Inlet. LEX (1972) The 82 foot wooden fishing vessel Lex was consumed by fire March 8, 1972 near Alligator Island in the Shelikof Strait west of Shuyak Strait. All four crewmembers were rescued by the fishing vessel Rosemary. The Libby was valued at $4,000 with no cargo and was listed as a total loss. She was insured for $2,000. LIBBY 20 (1958) The 16 ton 35 foot wooden gas screw fishing vessel Libby 20 burned July 9, 1958 at Bumble Bay, Kodiak Island. The No 2 was valued at $1,800 at the time of the tragedy and was fully insured. She had Departed Kenai August 1, 1935 bound for Salamato. The No 9 was valued at $924 at the time of the loss and had no insurance. Her last port was Kenai with a destination of Salamato. LIBBY MCNEILL & LIBBY IV NO 1 (1944) The 49 ton 60 foot wooden scow Libby McNeill & Libby IV No 1 stranded and was lost July 21, 1944 at Dry Bay Bar. LIBBY MCNEILL & LIBBY VII NO 5 (1940) The 23 ton 46 foot scow Libby McNeill & Libby VII No 5 foundered August 7, 1940 about 125 miles from Cape Greig in the Bering Sea at 56 25 N 162 06 W. No one was aboard the scow and no lives were lost. LIBBY MCNEILL & LIBBY X NO 2 (1953) The 34 ton 56 foot wooden scow Libby McNeill & Libby X No 2 foundered September 21, 1953 at Yakutat. LIBERTY (1958) The 66 ton 72 foot wooden oil screw fishing vessel Liberty was destroyed by a storm May 8, 1958 at Cape Ikolik on Kodiak Island. LIBERTY (1989) The 71 foot fishing tender Liberty sank February 15, 1989 approximately three nautical miles off of Cape Barnabas. The vessel began taking on water in the lazarette and sank in less than 10 minutes. The crew of four escaped to safety. LILLY (1961) The 18 ton 40 foot wooden gas screw fishing vessel Lilly was consumed by fire July 4, 1961 at Cordova. LILY MARLENE (1993) The 37 foot fishing vessel Lily Marlene was consumed by fire and lost August 30, 1993 in Chignik Bay. All three crewmembers made it to safety. LINA K (1924) The 10 ton gas screw Lina K was consumed by fire while out of commission at Aiaktalik Island at 9:00 p.m. November 26, 1924. No one was aboard at the time of the casualty. The vessel was owned and operated by Matrona Kaguyak of Aiaktalik and valued at $3,000. LINDA MAE (1974) The 30 foot wooden gas screw fishing vessel Linda Mae burned at Kodiak some time before 1974. LINDA’S DRAW (1988) The 47 foot longline fishing vessel Linda’s Draw capsized and sank in a storm April 11, 1988 in Icy Bay. The crew was rescued by another vessel that filmed the entire event. LINEA L (1909) The 13 ton 37 foot wooden schooner Linea L foundered on the beach at Portage Bay at 7:00 p.m. October 9, 1909. A strong NE gale was given as the cause of the casualty by master and owner Nels Peterson of Kodiak. The Linea L had left Kodiak August 6th bound for “Arkerprin Bay” with 3 crewmen on board. The crew made it to safety and assistance was rendered by the natives at Portage Bay. The Linea L was a total loss and had a value of $1,500. There was no cargo and no insurance. LISA DENISE (1993) The 31 foot fishing vessel Lisa Denise was destroyed by fire and sank September 7, 1993 at Naked Island in Prince William Sound. All three crewmembers made it to safety. LITTLE ANN (1990) The 90 foot longline halibut fishing vessel Little Ann foundered May 1, 1990 on Portlock Bank 60 miles east of Kodiak. The Little Ann sank bow first. All eight persons aboard were rescued by the fishing vessel Sandra Su. Two of those rescued did not have survival suits and suffered from hypothermia. The Little Ann’s EPIRB did not work. LITTLE BEAR (1989) The 90 foot trawler Little Bear flooded and sank March 28, 1989 approximately 25 to 30 miles off of Cape Chiniak near Kodiak. Her four crewmembers were rescued from a life raft. The Little Glory had a reported value of $5,000 which was a total loss. She was insured for $4194.13. All nine crewmen survived. LIVE HERRING (1964) The 78 foot steel gasoline powered fishing vessel Live Herring stranded and was lost at Afognak Island October 12, 1964. LIVELY JANE (2011) The wooden fishing vessel Lively Jane struck a reef and sank in the vicinity of West Anderson Bay July 13, 2011. The five persons aboard abandoned ship to a skiff as the vessel sank. LIZZIE WILLIAMS (1889) The 790 ton 159 foot wooden bark Lizzie Williams struck a shoal and was lost on Tugidak Island at 1:30 p.m. Tuesday April 22, 1889. The vessel departed San Francisco March 28, 1889 bound for Kodiak Island. She was carrying 82 passengers, 14 crewmen and a 1,100 ton cannery outfit and supplies worth $57,000. 75 of the passengers were Chinese cannery workers. The steamers Al-Ki and Elsie aided in the rescue of passengers and crew, all who survived. The Lizzie Williams, worth $16,000 and her valuable cargo were total losses. Conditions at the time were a five mile an hour wind, moderate weather, a heavy sea and daylight. Some of the cargo was recovered. LLOYD (1982) The 60 foot halibut fishing vessel Lloyd flooded and foundered June 9, 1982 approximately 25 miles south of Seward. All five crewmembers were rescued by the fishing vessels Gjoa and Marathon. LOIS V (1964) The 3 foot wooden oil screw Lois V was destroyed at Kodiak by the earthquake and tidal wave of March 27, 1964. LOMELA (1953) The 42 ton 51 foot wooden oil screw fishing vessel Lomela was consumed by fire September 7, 1953, 19 miles southeast of Kodiak. LOOKOUT (1886) The 67 ton 80 foot wooden schooner Lookout stranded and was lost after going ashore on Sanak Island in a thick fog at 11:00 p.m. Thursday June 3, 1886. There was a watch on deck of the Lookout with a moderate breeze and thick fog when the tragedy occurred. The vessel had departed San Francisco May 1, 1886 on a hunting voyage to the North Pacific with 15 crewmen aboard. The crew made it to safety, but the Lookout, valued at $9,000 was a total loss. She had no cargo aboard. LOON (1992) The 120 foot wooden fishing vessel Loon struck an unknown submerged object in the ship channel near Naked Island in Prince William Sound August 28, 1992. The vessel was traveling from Valdez to Homer. 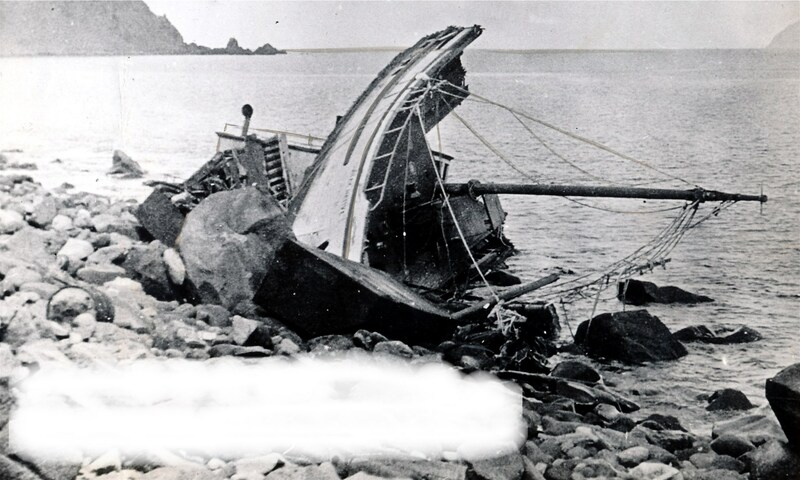 Fifteen hours later in Nuka Bay, the vessel capsized and sank in 600 feet of water. The two crewmembers escaped to a 16 foot aluminum skiff and were rescued by a U S Coast Guard Helicopter and were suffering from severe hypothermia. LOOSE GOOSE TOO (1997) The 26 foot cabin cruiser Loose Goose Too disappeared with two persons aboard October 26, 1997 in Kachemak Bay. The vessel was travelling between Homer Boat Harbor and Sadie Cove. LORA LEE (1986) The 32 foot fishing vessel Lora Lee capsized and sank May 30, 1986 approximately 10 miles south of Sequel Point, southwest of Cape Chiniak near Kodiak. All three crewmembers were rescued by a U S Coast Guard Helicopter. LORA LEE (1987) The fishing vessel Lora Lee sank near Kodiak October 1, 1987. LORA MAE (1992) The 42 foot fishing vessel Lora Mae burned to the waterline and sank June 18, 1992 in Chignik Bay. All four crewmembers were rescued. LORAINE (1988) The 45 foot fishing vessel Loraine was swept onto the rocks and destroyed September 8, 1988 near Yakutat. The two crewmembers waded to the beach and were picked up by a U S Coast Guard Helicopter. LORAL (1964) The 26 ton 48 foot wooden gas screw fishing vessel Loral was reported lost in the Good Friday earthquake of 1964 at Kodiak. LORRINDA G (1978) The fishing vessel Lorrinda G sank in the Bering Sea October 23, 1978. LOTTIE M (1964) The diesel screw Lottie M was destroyed by a tidal wave March 27, 1964 at Cordova. LOU ANNE (1983) The 65 foot tug Lou Anne disappeared April 7, 1983 with the loss of her five crewmembers approximately 145 miles southeast of Cordova. Captain Bill Martin of Anchorage, Russell (Rusty) McGuire (31) and Mel Morris of Honolulu, Larry Phillip of Alakanuk and Simeon Agathluk of Emmonak were lost. The Lou Anne was towing the 200 foot barge Sherry Lee which was later found beached about 12 miles southeast of Cape Suckling. LOUIS B (1969) The gas screw Louis B was consumed by fire May 10, 1969 at Nushagak in Bristol Bay. LOUISA DOWNS (1868) The 11 ton schooner Louisa Downs drifted into Dry Bay November 22, 1868 went ashore and wrecked. Her masts had been cut away in a gale to save the vessel. The Louisa Downs had departed Sitka October 13, 1867 bound for Hoonah, other villages of Icy Strait, Cross Sound and the Gulf of Alaska on a hunting and trading expedition. She had three crewmen and a cargo of trade goods and furs. After the wreck, the crew of the Louisa Downs found canoes at a deserted Native village in Dry Bay. They loaded their furs and trade goods in them and made their way west to another Native village, arriving on December 7, 1868. There the local Natives confiscated their possessions but took care of the three through the winter. In the spring they were transported to Cross Sound, arriving in Sitka June 23, 1869. LOUISIANA (1939) The 33 ton gas screw fishing vessel Louisiana stranded and was lost at the head of Pavlof Bay at 3:00 p.m. Wednesday July 19, 1939. The vessel struck a reef at the head of Pavlof Bay as they were leaving for King Cove. Conditions were a gentle easterly breeze and fog. The five aboard made it to safety, but the Louisiana was a total loss. The gas screw Umala tried to pull the Louisiana off of the reef but was unable. Several attempts were made to float the vessel but weather and tide conditions did not permit salvage operations. Axel Samuelson, owner and master of the Louisiana wrote the vessel off as a total loss. LOVAC (1987) The 32 foot fishing vessel Lovac was missing and presumed lost March 16, 1987 while fishing for black cod out of Kodiak. Presumed lost were James Shutter and possibly another crewmember. LOYAL (1956) The 23 ton 43 foot wooden gas screw fishing vessel Loyal was consumed by fire April 20, 1956 in Simpson Bay, Prince William Sound. The Lucile and her cargo were reported as total losses. The crew and passengers survived. Insurance on the vessel was $2,500 and her cargo $100,000. LUCKY BOY (1955) The 10 ton 32 foot wooden gas screw fishing vessel Lucky Boy stranded and was lost July 22, 1955 on the beach at the northeast end of Kalgin Island. LUCKY DEBONAIR (1974) The crab fishing vessel Lucky Debonair was believed to have been destroyed by a storm March 5, 1974. The 50 foot vessel was last seen near Marmot Island north of Kodiak on March 3, 1974. The vessel was traveling between Kodiak and Cordova with four crewmembers on board when she disappeared. Owner operator Chick Nims, his wife Esther Nims, Mike Pablic and Rick Woit, all of Kodiak, were lost. One body was discovered June 2nd clad in a wet suit bearing the name Lucky Debonair floating in Cape Chiniak Lagoon on Afognak Island. LUCKY LOGGER (1996) The 26 foot bowpicker Lucky Logger flooded and sank October 28, 1996 at the entrance to Day Harbor near Cape Resurrection. The only person on board was plucked from the Lucky Logger by a U S Coast Guard Helicopter. LUCKY PIERRE (1995) The fishing vessel Lucky Pierre flooded from the stern, capsized and sank May 8, 1995 south of Kodiak near Narrow Cape in Ugak Bay. Both persons on board were rescued by the fishing vessel Progress. LUCKY STAR (1964) The 44 ton 49 foot wooden oil screw fishing vessel Lucky Star was destroyed by a tidal wave March 27, 1964 at Kodiak. LUELLA (1869) The schooner Luella was driven ashore during a gale and lost in May 10, 1869. The vessel departed Sitka March 28 got caught in a gale and capsized. She was driven ashore and completely wrecked in the Barren Islands. The vessel was owned by Costello and Malowinski of Victoria. LULA II (1968) The gas screw Lula II burned August 3, 1968 at the Alitak Cannery at Alitak. LYNDA (1971) The fishing vessel Lynda ran aground and broke up November 5, 1971 near Cape Mordvinof on the northwest coast of Unimak Island. LYNDA K (1971) The 35 foot fishing vessel Lynda K was lost at sea April 15, 1971 between Homer and Seward. LYNN (1961) The 48 foot wooden oil screw fishing vessel Lynn burned between Hutchinson Reef and Woody Island near Kodiak December 24, 1961. LYNN D (1956) The 10 ton wooden gas screw Lynn D foundered 15 miles off of Cape Saint Elias on May 29, 1956.